South Africa’s investment sector has seen a sharp dip in confidence, reveals a new research report. Sixty-seven per cent of private firms in South Africa are holding back investment decisions due to “uncertainty in the future political direction” of the country. Accounting firm Grant Thornton released its International Business Report (IBR) on Monday. “There is no doubt that businesses are waiting for next year’s elections hopefully to bring stability and clarity on the future direction of our country,” said Grant Thornton South Africa’s National Chairman Deepak Nagar. Catherine Grant, Programme Head, Economic Diplomacy at South African Institute of International Affairs, says this was reflected by foreign investors at the EU-SA Business Forum last week. “The Grant Thornton report confirms the views reported by others on the ongoing concern of both domestic and foreign investors about the lack of policy certainty in South Africa. There has been little adaptation of policy approach following the global economic crisis with a fear that South Africa is not proactively seeking solutions to low levels of growth and high unemployment. Delays in process on policy initiatives such as the youth wage subsidy and the review of the foreign direct investment framework are contributing to the uncertainty,” Grant told The BRICS Post. Sixty-one per cent of business firms polled said the impact of crime on South Africa businesses continues to be on the increase. “It’s hard to understand how security costs for businesses just never seem to stabilise. Investing in securing your premises and protecting your staff is a massive cost outlay for South African companies and it is a sad state of affairs that crime is so financially burdensome,” said Nagar. Forty-eight per cent of those polled said they were looking to invest offshore rather than in South Africa, said the report. 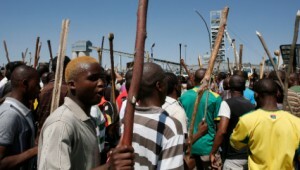 Labour unrest in the mining sector has also aided the dip in South African investment. In a significant dent to overall confidence of investor sentiment, 27 per cent are contemplating selling their businesses and 14 per cent are seriously considering emigrating. Poor utilities were a hindrance to business, especially water and electricity supply, said 81 per cent of respondents. “The economic slowdown is still extremely burdensome on the South African economy and additional local pressures are not helping at all. “The battling BRIC region continues to directly impact business expansion for South African privately held businesses while local service delivery concerns and political uncertainty persistently lash organizational growth,” Nagar said.